i-Size is a new European car seat safety standard that came into force in July 2013, it aims to increase the safety of children in cars by bringing the safety performance of car seats to a new, higher level. i-Size is the name of the first phase of a new legislation ensuring enhanced performance criteria for car seats for children from birth to 105cm (approx. 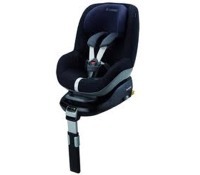 4 years) which are installed with ISOFIX. •	Length classification (as opposed to weight) for easier choosing of the right car seat - similarly to how children's clothing sizes work.